Cameron, Marilyn, Sandy, Kalen and I started shortly after 8 AM from the trading post. It was quite warm and I hoped for a breeze -- be careful what you wish for Once we left the West Fork, the route was overgrown and difficult to follow in some areas. We finally started getting a breeze after several hours of hiking but I was still suffering due to the heat and the relentless switchbacks heading up to Garnett Ridge. We stopped for lunch after gaining about 4 K.
When we resumed climbing, the wind picked up and started knocking us around. When we finally reached the plateau (the beginning of the burn area), clouds had rolled in with even stronger winds. Then it started raining We donned every article of clothing and slogged on. Instead of sweating profusely, I was now shivering and my teeth were chattering (Arocknoid -- reminded me of the scene in "Young Frankenstein" where Gene Wilder complains about the bitterly cold weather as they're digging up the corpse and Marty Feldman (Igor) responds, "Could be worse, could be raining..." and it started raining). Between the wind knocking us down/around and the whiteout, we weren't moving very fast. Cameron masterfully used the Gaia app on my iPhone to find the most efficient (less windy) route. As we approached Cedar Springs, it finally stopped raining and we were protected from the wind. The devastation wrought by the 2013 fire was heart-wrenching. 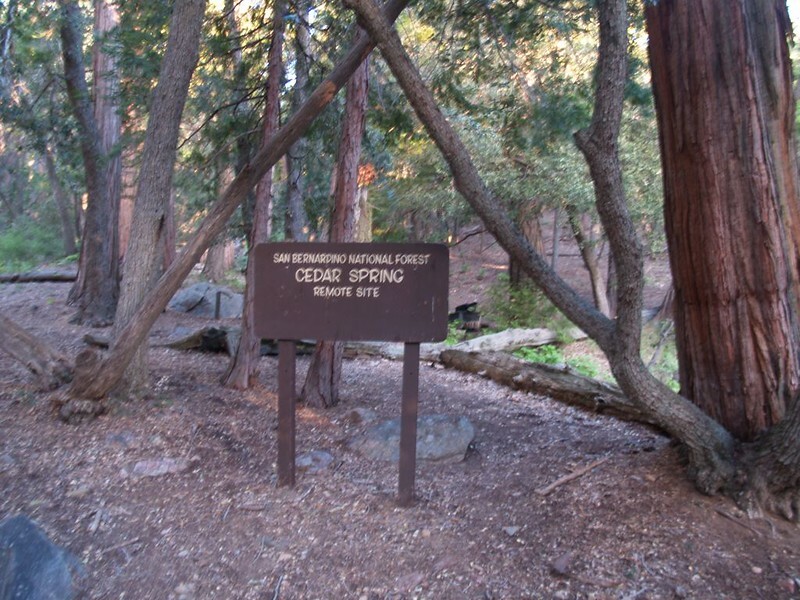 From Cedar Springs, it was only a mile to the PCT crossing (about 6.8 K). Then we hiked down the nicely-graded trail to the Cedar Springs TH parking and celebrated our epic hike with a fabulous dinner at the original Las Casuelas in Palm Springs. Stats -- about 6 K gain and 15 miles. Hi Ellen! Thanks for the TR. It sounds like you had a tough day! Vicki and I hiked that stretch of the PCT back on Memorial Day in 2013, a month or two before the fire. It was incredibly windy along that ridge top, but at least it wasn't raining on us. Descending toward Cedar Spring made all the difference when we had to set up camp on that windy day. It was like a calm, shady oasis in there among the huge trees. Very peaceful. I'd heard that the spring had burned, but I haven't seen any photos of the big trees. Did they get hit by the fire? I hope not. 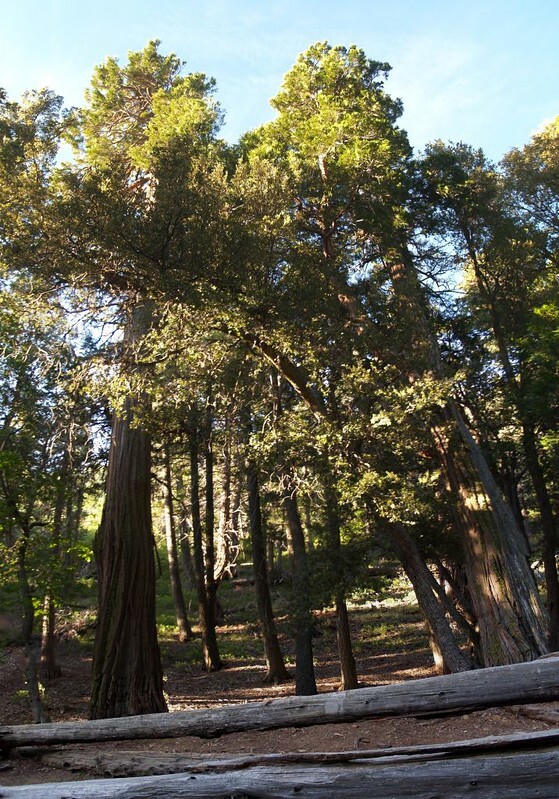 It'll take a very long time for trees that large to grow back. Did you visit the spring itself? Any photos? Thanks for the TR, Ellen. I was all set to tell you an anecdote about a practical joke I played on Gilda Radner made possible by weather events affecting Gene Wilder. Some of the big trees at Cedar Springs survived.